Unlike how I feel about books - so many books, so little time! 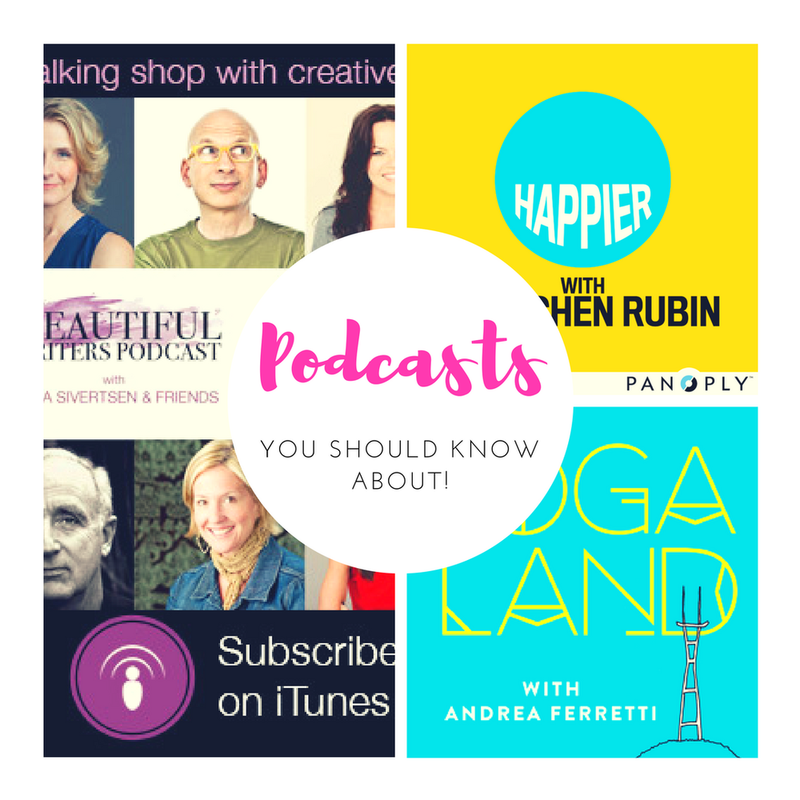 - I feel that there is so much time in my day when I could listen to a podcast (commuting, exercising, walking the dog, feeding baby, before bed) and not enough good podcasts to fill it with (or, rather, not enough that I know about). So, I feel compelled to share my favourites with you - and ask that you recommend me some goodies back! 1. This American Life - Short stories on a different theme each week. This was the podcast that originally got me hooked on the medium way back in 2011; you can't help but love the host, Ira Glass, and this show is so well produced it's ridiculous. I met Gretchen in Seattle in 2012. She's amazingly articulate in real life as well as on the page. 2. Happier - Self improvement without being cheesy or annoying. Gretchen Rubin and her sister Elizabeth Craft discuss small yet totally implementable ways to improve your life and make you feel a bit happier. I've incorporated so many of her ideas into my life and have without doubt found myself more content on a daily basis as a result of listening in each week. The best part? Many of the tips and ideas are so easy, you're left wondering 'why didn't I think of that?'. A LOT. 3. The Moth - Personal story telling told to a live audience. If you can't travel around the world and meet amazing, interesting, diverse people (surely the best part of any travel experience) then The Moth will bring these individuals to your car or home. 4. YogaLand - For the fellow yoga nerds out there, host Andrea Ferretti discusses everything from the Patanjali & the yoga sutras to how yoga can help with addiction and recovery. Oh, and great interviews with people like Yoga Girl. 5. The TED Radio Hour - audio recordings of the popular stage talks. 6. Woman's Hour - Topical discussions and interviews on a range of issues affecting women. If you can't listen in to this great Radio 4 show each morning (M-F), then you can catch up with the podcast which goes live the same day. 7. Beautiful Writers Podcast - Interviews by Linda Sivertsen (Book Mama) with interesting writers. If you're a writer you'll find yourself nodding along to this thinking 'THESE ARE MY PEOPLE'. 8. Being Boss - two lovely American gals (one of whom has the loveliest voice ever!) discuss resources and tips for creative business owners to do better work - and play harder, too. 10. By the Book - Described as "half reality show, half self-help podcast, and one wild social experiment". Comedian Jolenta Greenberg and her skeptical friend Kristen Meinzer follow the rules of a different self-help book for two weeks and record the results in each episode. The results are hysterical and often insightful. 11. Side Hustle with Chris Guillebeau - This is a super fun one to listen to everyday - that's right, he releases a new episode daily! It's great for getting inspiration on how to create a side income for you and your family, with novel case studies on how people have started a side business alongside their regular job. Wanna make more money in 2018? Make listening to this a part of your day to get those ideas a-flowing. Over to you - what should I try listening to this weekend?